Earlier in the year, we chatted to our pals at Killing Moon Ltd, a very fine blog-label-clubnight, about their future plans. BLUEBELL came up and we're glad to say that the London duo are finally putting out their debut single on the aforementioned label, in June. On the basis of the two tracks you can listen to below, 'Normal Heights' and 'Cinderella', the band have produced one of the highlights of the pop calendar in 2012. BLUEBELL comprises the talents of Annabel Jones (daughter of the late Davy Jones of The Monkees) and Charlie Westropp, the former adding her luscious vocals to the latter's electronic-infused production. The duo came to minor prominence early last year with the demo of 'Normal Heights', downloadable for free below. 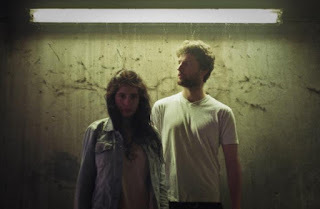 The London duo have spruced up the track and it will be released as a double a-side with new track 'Cinderella'. The new version of 'Normal Heights' has been mixed by Liam Howe, who did sterling work on the debut Marina & The Diamonds album, making the single sound even more massive than previously. And not just in terms of its extended length. The otherworldly 'Cinderella' opts for a subtly different tone, almost contradictory in mixing staccato rhythms with Jones' flighted vocals. It's a fascinating melting pot, suggesting at the very least interesting things for the future....if not, wheelbarrows of cash. 'Normal Heights'/'Cinderella' is released on June 11th digitally and on 7" vinyl. Find more info at Facebook and Killing Moon Ltd.